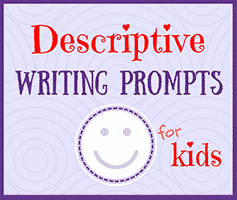 Descriptive Writing Prompts to Teach Kids about Storytelling–Storytelling is a long and time-honored tradition—and it’s one that, in today’s world, is especially enjoyed and practiced by children. From excited retellings of the day’s most important events to poring over their favorite chapter book series, kids of all ages love sharing stories. That’s why storytelling is such a fantastic way to get kids interested in writing. Students who are bored by the prospect of writing a book report or answering a word problem in their math books will be much more interested in the art of composing and drafting sentences and paragraphs when doing so enables them to tell a story. 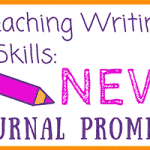 And one of the best ways to get students accustomed to telling stories is through the use of descriptive writing prompts and practicing in their journals. 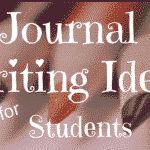 In these new journal prompts, students will learn about storytelling by practicing their own story writing and by examining the characters in some of their favorite books and TV shows. 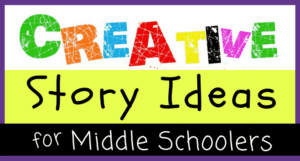 From imagining brand new characters to coming up with new plotlines for some of their favorite familiar faces, kids will learn how to construct compelling new narratives—and practice their writing skills along the way. 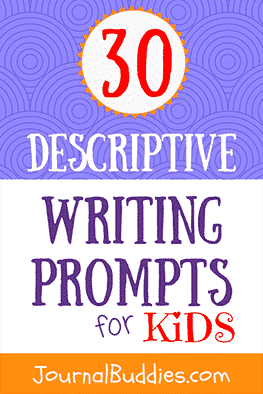 Use these 30 new prompts to help your kids learn more about descriptive writing! Rewrite your favorite book into a short story in your own words. Write an original story using only the characters from your favorite TV show. Write an original story using only the characters from your favorite movie. Write a story about a family’s kitchen faucet that poured out chocolate instead of water. 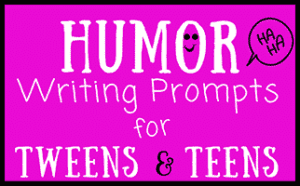 Write a story about how you and your best friend originally became friends. Think about an animal shelter and tell the story of one of the animals becoming adopted by a family. Imagine that the appliances in a family’s kitchen could talk when the family was not present. 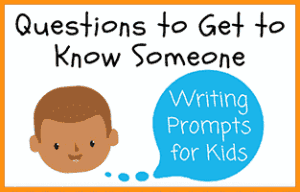 Write a story about what they would have to say to each other. Write a story using the plot from your favorite book, but insert yourself and some of your classmates to replace all the characters in the story. Think about how the story changes when the personalities of the characters are different. 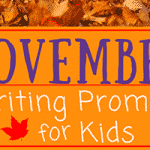 Write a story about a family who has a tree with dollar bills for leaves in their backyard. Think of one of the characters from the last story you wrote and write a brief biography of him or her. What does the character look like? What is his or her favorite thing to do? What is the character’s dream job? 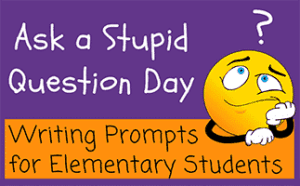 Write a story about a kid and the principal at his or her school trading places for one day. What was it like for both of them? Did they like their different roles? Write a story about a chef who creates a new recipe that everyone loves and can’t eat enough of. Write a story about a cat and dog that do not like each other, yet must overcome an obstacle together, helping each other along the way. Write a story about a flying buffalo that wants to travel to the moon. 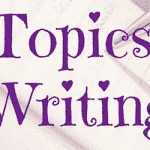 Write about the adventures of a monkey and an elephant that are best friends. Write a story using at least three of the following five things: a bicycle, a tube of lipstick, a pizza, a hedgehog, and a tennis racquet. 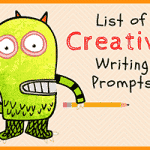 Write a story using at least three of the following five things: a lamp, a banana, a movie theater, a baseball cap, and a pony. Write a story using at least three of the following five things: a pair of skis, a notebook, a basketball player, a waffle, and an eraser. Write a story about summer camp where all the characters are animals. What activities will they do? Which animals are the counselors? 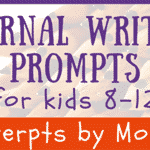 Write a fictional story about one of your parents as a kid. Use other real characters like your grandparents, aunts, and uncles, but make up the setting and plot. Write a story where the main character gets locked in the grocery store overnight. 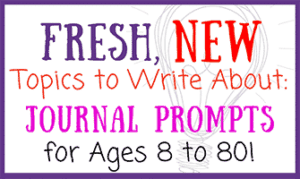 Write a story about a little boy or little girl who was the king or queen of their country. Imagine that you and three of your best friends suddenly discover you can fly. Where will you go? What will you do? Write a story where the main character receives a mysterious letter in the mail. What does the letter say? 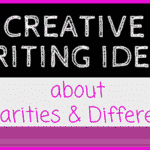 Write a story about a day in the life of a boy or girl who is much stronger than everyone around them. 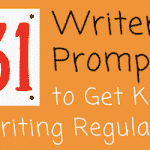 Write a story about a new baby who is born and can speak in full, intelligent sentences right away. Write a story about yourself 10 years in the future—but give yourself one trait, like, or dislike that is the complete opposite of one that you have now. Explain how you got to this point in the story.